It's time to spring clean the kitchen! So lets get motivated to get this done! Earlier this week I filmed myself spring cleaning my apartment kitchen which you can see here. It might help give you some motivation to get yours done too, so definitely check it out! I cleaned all the dishes that were currently in the sink and then dried them and put them away so all my dishes would be clean. I took my dish drying rack and washed it as well since it can get a little gross. I also took the drying mat and threw it in my laundry pile so that would get super clean as well. Next I went through each cabinet and drawer and pulled everything out, wiped down the inside and then put everything back inside. I did make sure to only put things back in that we actually use. Since we have very limited space in our kitchen we use pretty much everything that we have. We actually have quite a few kitchen items that aren't stored in our kitchen because we don't have a ton of room. I made sure to scrub down all of the utensil holders as well. I do have a couple of permanent stains inside some of them and at some point when we move into a house and have a large kitchen I may decide to purchase all brand new matching ones. With only three big cabinets, two small cabinets (one over the fridge which is kind of inaccessible), and five drawers we don't have a ton of room for kitchen supplies but we make it work. Since we live in the apartment I am also pretty limited on changes I can make and I would love to one day have white cabinets and a real granite countertop. Right now I can't change any of those things so I will just do my best to keep things clean until then! All of our spices are kept above the stove and I talked about this transformation in this post and this post. There are some stains in this cabinet I also can't seem to get out which is frustrating because I feel like it never looks clean! I also wiped down the stove and the front of the oven. I also cleaned the microwave and wiped down the counters. The only things I didn't touch during this particular clean were the fridge/freezer, under the sink cabinets, and the pantry. I am planning on tackling each of these projects separately since each of those can be very overwhelming. When I was done with this clean I was exhausted but very satisfied with how everything turned out! 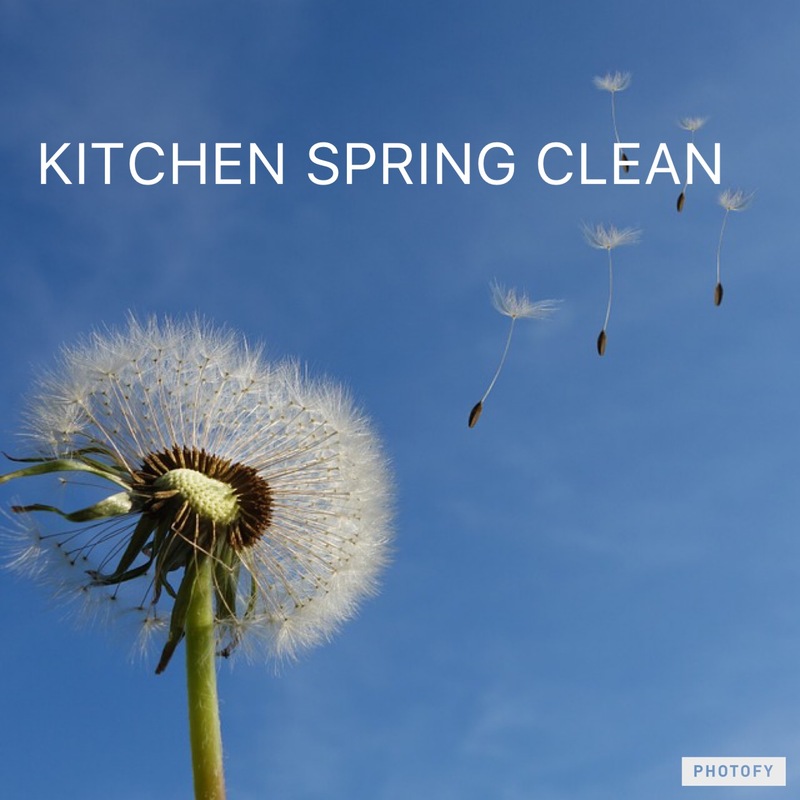 What spring cleaning projects are you working on this weekend?